I use Cheyenne because after trying many other equipment I found Cheyenne to be most efficient and precise but most important reliable equipment. It has improved my work overnight. The best tattoo equipment I ever used. I use the Cheyenne HAWK PEN. I like the perfect combination between the consistence of the stroke and the softness, it makes it perfect for my kind of work. Additionally, I like the quality of the cartridges and the precision of the needles. I started tattooing 27 years ago. I was about 16 years old when I got my first tattoo from someone that tattooed in his house and it came out really bad. 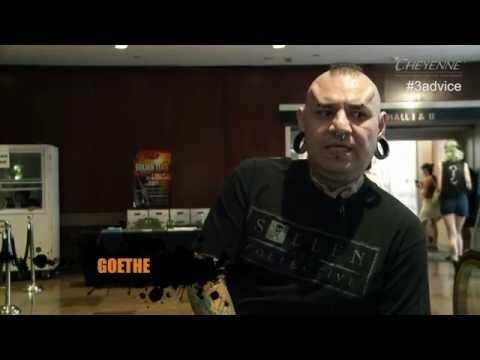 Tattooing in Mexico at that time was really a taboo. I came home really upset and my father asked why, I showed him and he asked me: „You think you can do a better job?“ I said: „Yes“, and then my father built me my first hand made machine. The first tattoo I made was on my father, it came out good and after that I just started tattooing for fun. I started tattooing my father, my brother and friends until some years later I decided it would be my career. At the beginning, I tattooed everything even though I always liked black and grey tattoos better. At one point, I decided to just focus in what I really liked. I liked black and grey, high contrast and I was influenced by old school black and grey artists, that I am happy to now call my friends: Paul Booth, Robert Hernandez and Bob Tyrrell. I also decided to focus on pre-Hispanic cultures, because I admire the richness and the darkness of it.